To empower researchers and enable data-driven discovery The Carpentries movement develops and teaches workshops on the fundamental data skills needed for research. Together with its sister organizations, Software Carpentry and Library Carpentry, Data Carpentry focuses on teaching computational best practices to scientists and has built a shared community with more than 1000 certified instructors and 47 current Member Organizations around the world. 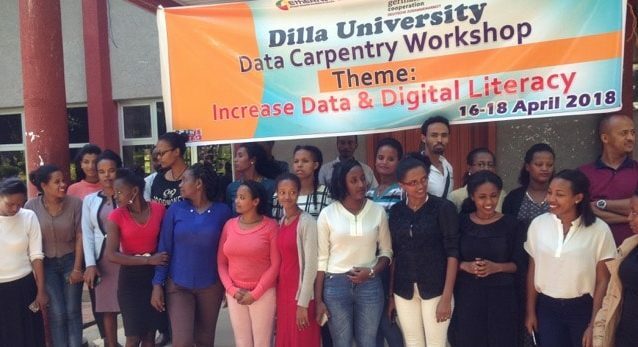 In Ethiopia, the local Education Strategy Center (ESC) launched a series of Data, Software and Library Carpentry workshops in August 2017 in collaboration with the Ethiopian Research & Education network (EthERnet), and funded by the German International Cooperation (GIZ), using the motto: “Increase Digital Literacy of Researchers”. To date, more than 400 people have participated in 13 workshops, with an additional 30 (Data Carpentry and Software Carpentry) workshops at 15 different locations across the country to be conducted before the end of October 2018. As an example, the organizers have arranged Hackfests for researchers trained in the programming language R, to encourage them to improve their coding abilities for a “better Ethiopia”. Researchers and experts from different disciplines were invited as a team to analyse the same database. By using R as a coding language, and within a time frame of six hours, the team had to explore the database, formulate a research question and draft a project proposal or research idea for further exploration. According to Mesfin Diro it is important to bring more instructors into the ecosystem. “Work on that has begun and soon we will bring an additional 17 certified trainers into the project. And we want to work not only in our own country, but reach beyond Ethiopia to Sudan, Kenya, and Uganda as well. The project is focusing not only on researchers but also on librarians. Librarians are the knowledge core of a university, and they need to become the counterpart to researchers – the data analysts, data scientists and advisors for all digital data issues relevant to researchers. Mesfin Diro is part of the Carpentries African Task Force, a team of eight instructors based in South Africa and Ethiopia. The task force members come from a variety of disciplines including the libraries, digital humanities, bioinformatics, public health, ecology/engineering, life sciences, and computer science. Their role is to mentor instructors and helpers before teaching a workshop, and to nurture the African Carpentry community of instructors.